We’ve already been over the whole hatred of tummy time do I really have to tell you how much I hate the car seat? Why oh why do you insist in trapping me in here rather then holding me close like you claim to like so much? 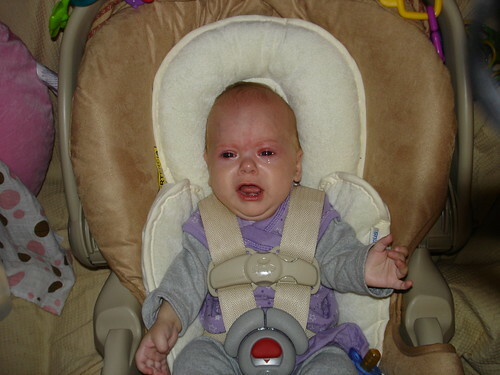 I have to admit its kind of fun when Daddy swings me in the car seat but then you guys put me in the back seat all be my lonesome and as a big slap in the face you make me face backwards. I don’t care how many fun toys (and they are fun, thanks) you hook on it I will still scream 95% of the time we are in the car just to remind you how much I hate it. Sometimes when you sing to me I like that and will give you a little break but most of the time I’m just too mad about being all alone to care about twinkling stars or rowing boats and the marching ants that never do the same thing twice. You try hard to convince me that the seat is the “safe” way to travel but I’m super skeptical. I mean you and Daddy don’t use them, why should I? And stop telling me to take a nap in it. I don’t want to go to sleep, I might miss something. I do appreciate that you and Daddy take me out when we get to the store. I really like looking around at people and I really like it when people stop us and remind you how cute I am. But then you put me back in it when we go to leave, its not fair! This week I was inspired by this picture. Please take a good long look at the above picture and notice something. 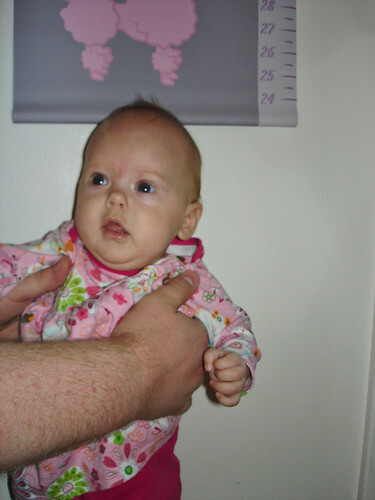 I am now standing (with Daddy’s help, thank you Daddy) and the top of my head is over the dowel in my growth chart. Please remember that on my 5 month birthday (10 days ago) I didn’t even come up to the bottom of the chart. I may not have gained much weight this week, but I gained height. Now go tell the doctor (whom I normally really like, she’s very nice) to stuff it. I’m fine. I’m petite and I like it that way. I mean think about it. 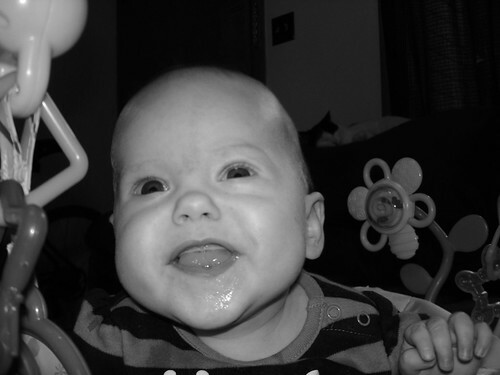 I can still wear some of my newborn size clothes. And you know how cute some of those are so that’s a good thing. You’re getting your moneys worth out of those clothes, unlike some Mommy’s who get to dress their babies in something once and then they outgrow it. You’re lucky. 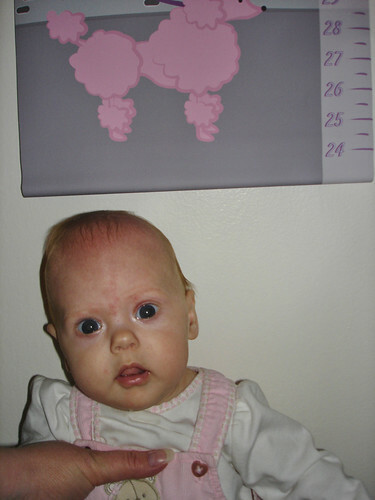 I have included the picture from my 5 month birthday for easy comparison. p.s. Just like you I look really good in dark pink. I don’t know what I do sometimes to tick you off so badly that you put me on a blanket on the hard floor on my tummy and tell me that its “fun”. I try to be super cute and good but sometimes it seems like that just encourages this toture. I would rather be on your soft warm body then anywhere else. I’ve rolled over in the past, do I really need to prove that I can again. I hear mobility is totally overrated. You like carrying me around, can’t we just keep that up? So in closing please stop giving me tummy time.